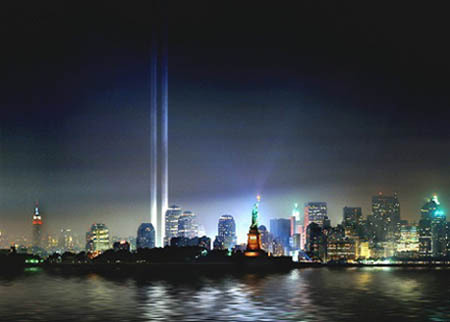 9/11 Heroes Are Honored: Moments of silence, pledges that good will overcome evil and twin beams of light began piercing the night sky on Monday, March 11, 2002 commemorated the six months since terrorists attacked the World Trade Center. More than 2800 people died at the site where the buildings collapsed. The World Trade Center dead also included 343 firefighters and 37 police officers from the Port Authority of New York and New Jersey. First, on a cloudless morning similar to Sept. 11, officials dedicated a massive sculpture that had been damaged in the attack as a temporary monument. "The Sphere" -- a steel and bronze sculpture created in 1971 by artist Fritz Koenig to promote peace through international commerce -- was partially crushed by falling debris from the towers. Later, when darkness fell, officials gathered again to turn on two huge beams of light that soared into the sky to symbolize the twin towers. The "Tribute in Light" was switched on by 12-year-old Valerie Webb, whose father, Port Authority Officer Nathaniel Webb, was killed in the attack. The temporary memorial light display was visible from March 11, 2002 through April 13, 2002. Depending on weather conditions, the columns were expected to be visible for at least 20 miles around the trade center complex. Several other pictures of this "Tribute in Light" including credits for the project can be found here. One Nation: America Remembers September 11, 2001 - The editors of LIFE® give a powerful, heartbreaking yet inspiring account of the events of Septemer 11th and their aftermath in this riveting 192-page book. Exclusive introduction by New York City Mayor Rudolph Giuliani and over 200 rare and touching photographs. Order this book at a 40% discount by clicking on the book title or cover.